Anarchist Communist Group members are saddened to hear about the death of veteran Irish anarchist, Alan MacSimoin. 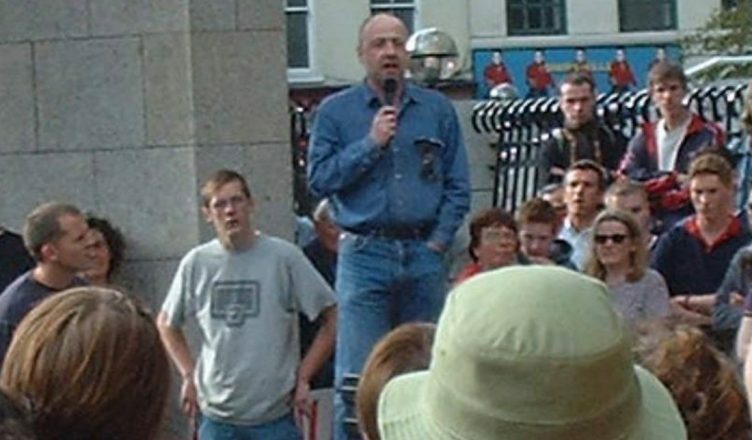 Alan started his political life with Official Sinn Fein’s youth organisation when still at school but broke with republicanism and went on to help set up Dublin Anarchist Group in 1978. Later he was involved in setting up the Anarchist Workers Alliance and later still he was a founder member of the Workers Solidarity Movement. Although Alan parted company with the WSM more recently, he nevertheless continued to be active politically until his death. Alan was on the platformist wing of the libertarian movement. I am shocked and saddened to hear of the news of the death of Alan MacSimoin. In the 1970s as national secretary of the Anarchist Workers Association I corresponded with a young man in an Irish Republican youth organisation who had started considering anarchist ideas. This was Alan and he went on to working with us to setting up an anarchist organisation in the Republic , This eventually became the Workers Solidarity Movement. Alan parted with the WSM some years ago but he remained an active anarchist till the end. He was bright and acerbic and always well dressed whenever I met him. A great loss to the movement and to the world. Totally choked to hear this news. The ACG offers its condolences to Alan’s family, friends and comrades past and present.